Today marks my first Twitterversary. Yippee yahoo, happy Twitter Birthday to me. As a social networking platform, I have truly loved the interaction that Twitter (and my Twitter network) affords me. In looking back over the last 365 days (and 2,543 tweets), I’m both amazed at how much I’ve learned in just 140 characters and equally concerned about what implications Twitter and similar technologies have for the future of creativity. I’ll first illustrate my concerns with a simple diagram, following explanation with a series of questions. Maybe you can provide the answers. Let me begin by saying that blogging has done more to improve my writing than any class I’ve ever taken, book I’ve ever read, or pill I’ve ever swallowed. To write – and to think – for an often international audience on a semi-regular basis has forced me into measuring my words carefully. It has also helped me to sound smarter than I actually am. The ability to express my thoughts in word – mingled with pictures, video, and other kinds of media – not to mention the social interaction experienced through blogging, has truly elevated my thinking in ways unimaginable just months prior. This hints at, in some measure, my concern. You see, blogging carries with it a potential to expound, elaborate, and develop. Written posts can be short or they can be long, fused with images or sound or video or silence. A blog post is truly an empty canvas, waiting to be fashioned by the literate artist. 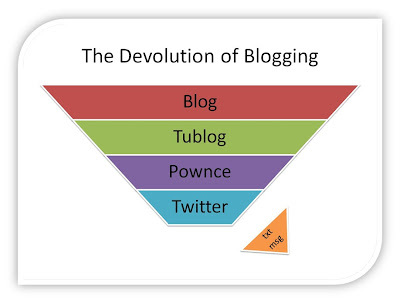 But as blogging devolves (unfortunately for all? ), the process is simplified and the limits of emerging technologies, tools, and trends, become far more apparent. A tumblog, for example, is often much shorter than a traditional blog post – a burst of thought, an idea, an expression of content worthy enough for half-hearted submittal. And Pownce? Yes, nice try. You may post messages, links, files, and events (and even socialize), but to elaborate? Nay. Not here, good boy. You’ll be hard-pressed to take that thoughtful drivel elsewhere. Then Twitter, you tease, with your seductive 140. Even I can find words sufficient to fill such a gap. After all, I’m well-trained in the use of text messaging. And shallow thought? Well, that’s easy – for even my kids have taught me to text. Because Who. Really. Needs. More? Strange how technological trends ofttimes return to those once simple roots, isn't it. I gueS datz wot woriez me most. In embracing such simple tools for collaboration are we trending toward mediocrity – in our writing, in our reading, in our thought? With so much information and so little time, are we shrinking the attention spans of our youth in such a manner that they truly will lose the ability to think in sentences longer than 140 characters? If Shakespeare or Poe or even Dickens were bloggers today, do you think they would also tweet? And if so, how would such writing affect their work?